Many organizations approach Automation and RPA in a very tactical manner. A strategic approach towards automation is necessary if it has to yield the desired benefits. For a strategic approach to succeed, one should not look at just a department but look at the entire organization. The vision has to be broad even if the implementation is narrow. Just like any IT project, RPA is beset not only by the normal project challenges but also faces immense resistance from end users. Remember the promise of RPA is to reduce headcount drastically. It is obvious that existing agents and employees will not take to this change kindly. RPA is a rapid IT project, driven by non - IT staff and faces higher risks, because it demands prerequisites and some key best practices to be followed. Most of these best practices are new to many stakeholders in a organization and it will require time before an organization can gain competency and proficiency in these areas. I have tried to articulate a few critical steps that organizations need to follow. Stricter adherence to best practices yields systematic, sustained and consistent benefits. If done properly projects can run smoothly and it will be easier to implement projects in a scalable manner. Failure to do so may make every project a heroic implementation project and prevents RPA from being implemented in a scalable manner. A majority of the processes in an organization are complex in nature with multiple process scenarios/use cases/variations for every process. The number of variations is dynamic and change based on the business rules or underlying change in the application. Many of these processes are not documented and reside in the heads of experts in the organization. While this state of affairs may be ok in the normal course of business, RPA implementation demands accurate availability of all variations and information. Organization need to document all the variations of a process. The documentation process itself cannot be a onetime activity since the process undergoes regular changes. A robust change management process needs to be instituted. The process documentation of the process need to be stored in a central repository with necessary access controls and version control procedures in place. Any change must be recorded in a regular and consistent manner. The process documentation and content should be distributed to all the stakeholders and end users. All process variations should be benchmarked and an organization must have data on Transaction time (TAT), error rate and other key metrics. Most organizations have rudimentary data on their processes-i.e. average data for an entire process or the process major variations. But data on time to complete a particular process variation, time across end users (tenured /non tenured agent), metrics across geographies is essential before commencement of a RPA project. The frequency or the number of times a process variation is executed, error rates or key metric data for every process variation is also important. A robust automated process for gathering and modeling this data will make the entire process seamless. The key objective of automation and expectations need to be articulated and defined upfront. Change of expectations at a later date while the project is midstream can be catastrophic. Is the objective of automation to reduce the total number of agents, or is it to reduce error rates, or improve queue time or is it some other key metric that is of deep concern or is it a combination of the above? Is the RPA implementation going to be a completely automation of the process or is the objective only to automate it partially? While a small minority of processes (<20%) can be automated completely most processes can only be automated partially. There are also many situations wherein the road to complete automation is complex and time consuming. Even though the end goal is to completely automate the process, it may make sense to start with a partial automation scenario. It is better to start even if the ROI is 10% if the end case scenario benefits are substantial. In some cases, critical variations of critical aspects of the process may be automated first. In many aspects, RPA development is similar to product development. A robot is in fact a specific product for that process. Robot development cannot be a onetime activity. Roadmaps, future development plans, plans to accommodate changes in the process need to be factored in during the initial stages and laid out in the roadmap. The process may be a candidate for complete automation and an organization may start with a much smaller version. It may implement subsequent changes in future versions. The decision to go for a big bang approach or an incremental approach depends on the specific process and the supporting infrastructure of the organization. A robot is only as good as its design. A good solution architecture can give immense upfront benefits, make change management easier and can also make the solution robust. Solution architecture needs to be bold but yet not be blue sky stuff. A good solution architecture is the result of a healthy balance between technological environment, the process characteristics, the end user profile, the roadmap and the key objectives of automation. If all the previous steps have been followed, it might be a straightforward task to arrive at the savings expected post automation (Post various versions of the robot). ROI can be fluidic and subject to lot of debate and subjectivity if an organization does not have all the accurate data as listed above. Faulty adherence to the steps can sometimes lead to failure of the RPA implementation. - Every tool has its own peculiarities. A pure play product vendor will not be able to guide an organization in a RPA implementation project (despite having the right partners). A product organization that can understand product development and that has been involved in many RPA implementations can help navigate organizations through the various obstacles, limitations and roadblocks that may otherwise be insurmountable. So choose a product vendor which has rich experience in implementation. - Most processes that have to be automated involve some amount of complexity. Despite the marketing talk more than 90% of RPA implementations will involve script development. Drag and drop functionality is useful only for the simplest of the processes. While GUI features for rapid development will help, they are of peripheral importance while selecting the right tool. The robustness of the underlying technology, the breadth and vision of the vendor, the flexibility of the vendor to adapt to changes, the quality of support provided by the vendor is of paramount importance. The nascent stage of RPA in many organizations requires enormous support at various levels- strategic, tactical, implementation, architecture, actual product usage, best practices of product etc. - RPA development requires many additional features not directly related to robot development. 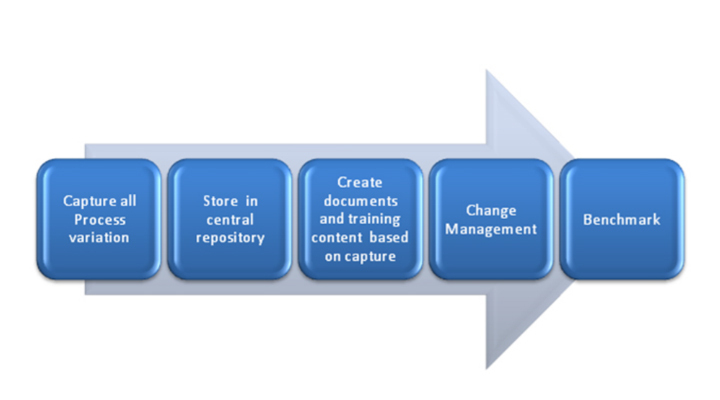 Sophisticated methods to capture and store process variations, central repository management, collaborative development, rapid development of AS -IS/TO-BE process documents, simulated content, dissemination of these content, ability to certify end users, robust modeling, capture of metrics post RPA implementation are all key to making implementations successful. It might be preferable to select a single vendor who provides these features rather than approaching multiple vendors and stitching together the features to match the project requirement. Once the RPA is implemented for the process the new TO BE process needs to be captured and content needs to be created for all the process variations of this modified process. From the captured process, training content needs to be created and centrally distributed to all the end users. The end users should be trained and certified on the new process. New metric development process also needs to be put in place. The plan for the whole cycle needs to be identified well in advance. A detailed plan for rollout is necessary. During the initial stages of RPA deployment, the actual performance may decrease. This is the result of a combination of teething issues, learning curve of the end users, technology infrastructure and other factors not identified during the initial stages. Any rollout should be gradual. The robot should be first rolled out in the training environment, the results should be compiled, and the system should become stable post which it should be deployed in the production environment in a limited manner. As the end users become more proficient, the robot can be rolled across a larger number of users. A detailed rollout plan is essential and should be defined at the beginning of a project. Manual methods of capturing metrics of performance on the modified process may not be accurate. It is essential that as a part of the infrastructure, the RPA system should give data on actual usage, performance across user profile, geographies, process variations etc. A single multifunctional team drawn from Process excellence team, process experts, IT, project management experts, and solution architects is required to make these projects successful. The team should be able to address strategic and tactical issues at the same time. An IIT graduate from Chennai, and the youngest professor to be invited to IMT Ghaziabad, Ravi Ramamurthy’s achievements are varied. He is a member of the executive committee of Science Olympiad Foundation, the largest Olympiad in the world. He is the CEO and Founder of a software product company called Epiance, which has clients all over the world, clients who vouch for the product line which he created. He has 30 years of experience in the corporate arena. R. Ravi has been a pioneer of knowledge management and business process modeling. He was one of the founders and early evangelizers of Electronic Performance Support. The innovative process capture technology that he conceptualized and developed was instrumental in creating the rapidly growing performance support industry that is the foundation of today's business process mapping, knowledge management, real-time e-Learning and performance improvement enterprises. R Ravi was one the of the early creators of the foundations for automation. In fact the first automation product that he created in 2003 was well ahead of its time. Many of the these ideas form the basis for the Robotic Automation product that is becoming very popular today. 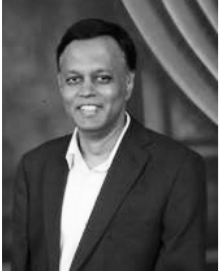 R. Ravi is responsible for a host of software, technology and product innovations including the development of modeling and charting software and the creation of original multithreading concepts found in today's relational databases. He has multiple patents (patent pending)to his name. Ravi's success as an entrepreneur and a business leader lies in his ability to transform these innovations into pioneering and successful products that are globally sought after and used by the world's best performing companies.